Engineers and scientists collaborating at Harvard University and the MITRE Corp. have developed and demonstrated the world’s first programmable nanoprocessor. The groundbreaking prototype computer system, described in a paper appearing Feb. 9 in the journal Nature, represents a significant step forward in the complexity of computer circuits that can be assembled from synthesized nanoscale components. It also represents an advance because these ultra-tiny nanocircuits can be programmed electronically to perform a number of basic arithmetic and logical functions. “This work represents a quantum jump forward in the complexity and function of circuits built from the bottom up, and thus demonstrates that this bottom-up paradigm, which is distinct from the way commercial circuits are built today, can yield nanoprocessors and other integrated systems of the future,” says principal investigator Charles M. Lieber, who holds a joint appointment at Harvard’s Department of Chemistry and Chemical Biologyand School of Engineering and Applied Sciences. The work was enabled by advances in the design and synthesis of nanowire building blocks. These nanowire components now demonstrate the reproducibility needed to build functional electronic circuits, and also do so at a size and material complexity difficult to achieve by traditional top-down approaches. Moreover, the tiled architecture is fully scalable, allowing the assembly of much larger and ever more functional nanoprocessors. 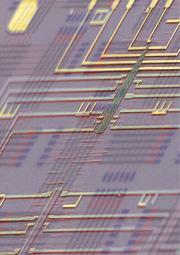 An additional feature of the advance is that the circuits in the nanoprocessor operate using very little power, even allowing for their minuscule size, because their component nanowires contain transistor switches that are “nonvolatile.” This means that unlike transistors in conventional microcomputer circuits, once the nanowire transistors are programmed, they do not require any additional expenditure of electrical power for maintaining memory. “Because of their very small size and very low power requirements, these new nanoprocessor circuits are building blocks that can control and enable an entirely new class of much smaller, lighter-weight electronic sensors and consumer electronics,” says co-author Shamik Das, the lead engineer in MITRE’s Nanosystems Group. “This new nanoprocessor represents a major milestone toward realizing the vision of a nanocomputer that was first articulated more than 50 years ago by physicist Richard Feynman,” says James Ellenbogen, a chief scientist at MITRE. Co-authors on the paper included four members of Lieber’s lab at Harvard — Hao Yan, Ph.D. ’10, SungWoo Nam, Ph.D. ’10, Yongjie Hu, Ph.D. ’10 — and doctoral candidate Hwan Sung Choe, as well as collaborators at MITRE.